Advanced Vehicle Technology and the adoption of next generation vehicles is a strategic focus for Ryder. As vehicle and fuel efficiency regulations evolve and fuel costs increase, and as customers demand more sustainable vehicles, the viability and demand for next generation vehicles, including hybrid and electric vehicles (EVs), will continue to increase. Our ability to anticipate and respond to these changes can lead to lower operating costs for us and our customers, as well as reduced carbon emissions. Electric vehicles present a significant opportunity to increase vehicle fuel efficiency and decrease maintenance costs, while having a positive impact on the environment. For more information on our strategic and innovative activities, products, and services, see Innovation in an Evolving Marketplace. As consumers are seeking out greener and more eco-friendly products, our customers are focused on quantifying and reducing the direct and indirect impacts associated with their carbon emissions. 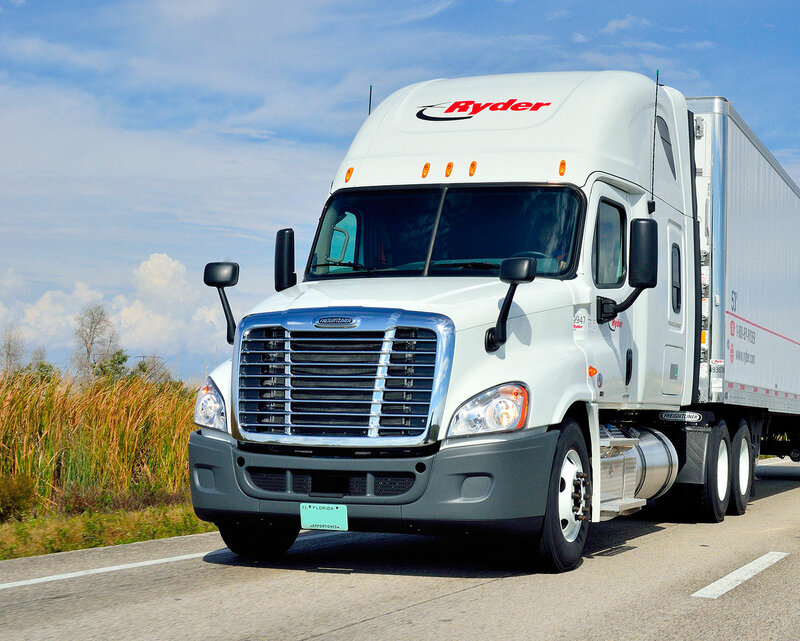 Ryder is uniquely positioned as a logistics and fleet management expert with 85 years of experience to help our customers maximize the efficiency of their transportation networks and access new and more efficient vehicle technologies. As the only fully integrated, end-to-end transportation and logistics provider, we add value for our customers by optimizing every step of their products’ journey. Whether it’s the type of fleet our customer utilizes, with solutions that include advanced vehicle technologies and fuel alternatives, or how that fleet is utilized, with solutions to maximize capacity utilization and reduce miles driven, Ryder has the tools, experience, and expertise improve efficiency for our customers and reduce their carbon footprint. Our scale and partnerships enable early adoption of next generation vehicles while mitigating potential challenges associated with these new technologies, such as fueling infrastructure and maintenance availability, by providing fueling and maintenance options in places where such services are needed. Providing these solutions not only supports our customers’ evolving needs, it also contributes to a sustainable economy and healthy environment. Each year, the cost of moving freight increases due to unpredictable fuel prices, driver shortages, increasing regulations, and a variety of other factors. As these issues compound, a company’s ability to reliably move their products becomes more difficult and costly. At Ryder, we understand the complexities of logistics and we are constantly adapting to this changing marketplace. Our solutions are built on a LEAN culture—if it doesn’t add value, it is eliminated. In our warehouses and on the road, these LEAN principles drive our operations, resulting in monetary and environmental savings. We work with our customers to understand their transportation networks and needs. From shipment volume volatility and distance traveled to number of pick-ups and backhaul opportunities, we help our customers identify the solutions that work best for them. By optimizing routes and maximizing freight loads, we strive to deliver the most product with the fewest miles traveled. Through advanced network and load modeling Ryder can achieve up to 23% reduction of customer scope 1 emissions (Ryder scope 3) by utilizing our optimized customer network. Ryder created the Ryder Green Calculator to help our customers measure, analyze, and report the greenhouse gas (GHG) emissions associated with their transportation footprint. The tool provides a simple, plug-and-play method for customers to input their freight loads and weights and obtain respective carbon emissions. By reporting on a monthly basis, customers can analyze their emissions over time and identify how different modes of travel—such as by highway, rail, ocean, or air—impact their footprint. Increasing the efficiency of our fleet includes regularly evaluating new technologies as well as retrofitting our current fleet so that we may continue offering our customers new and improved options. We have a dedicated team of internal resources to research and test these technologies. Our Senior Director, Advanced Vehicle Technologies and Energy Products oversees the implementation of new technologies and their supporting infrastructure, reporting to our Executive Vice President and Chief Marketing Officer (CMO). The Board receives an update on disruptive trends—including next generation vehicles—as part of the annual strategic review meeting. During this meeting, the Board discusses key accomplishments in this area, including new strategic EV partnerships, training on EV maintenance, charging infrastructure, and new sales. In addition, advanced technology metrics and goals are included in the annual goals set for our CEO. To advance alternative fuels and new vehicle technologies, Ryder educates our employees and customers through email, webinars, and social media communications, in addition to in-person meetings and operations/site evaluations. We work with many customers to quantify transportation-related carbon emissions and to develop carbon reduction strategies that work for their businesses. Additionally, Ryder works with innovative Original Equipment Manufacturers (OEMs) to bring efficient and emerging vehicle technologies to market. Ryder regularly evaluates new technologies and retrofitting opportunities based on changing customer preferences and market demands. By researching and testing technology before bringing it to our customers, we ensure that it’s right for our industry. We also identify vehicle fleet efficiencies through our participation in the U.S. Environmental Protection Agency’s (EPA) SmartWay program, and prioritize carrier partners who also participate in the program. By validating new technology ourselves, we use our expertise to ensure that products are evaluated through the lens of a fleet operator and not a truck manufacturer. To learn more about how we engage with our customers, see Customer Focus. Over the past two years, Ryder has partnered with various innovative OEMs, including Chanje, Workhorse, and Nikola, to offer their advanced vehicle technologies and grow our service portfolio. We provide service, exclusive warranty, and sales channels for these companies to our customer base. 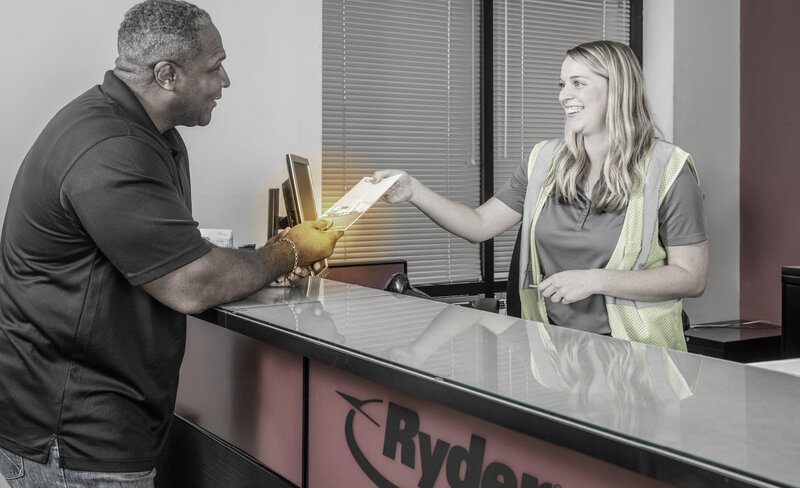 By partnering with these new vehicle OEMs, Ryder enables them to scale across North America almost instantly by leveraging Ryder’s network of 800 service facilities, 6,000 technicians, and significant customer relationships. Through our partnership with Chanje, Ryder offers the only nationwide lease and rental fleet of electric vehicles. The new V8070 panel van is the first medium‑duty electric truck option in the industry to reduce exhaust and noise pollution while minimizing fuel costs for local and last-mile shipping. As of year-end 2018, we provide these offerings across the United States, especially in California, where significant vehicle and charging infrastructure and incentives currently exist. Additionally, we have a select group of technicians who are certified to service this innovative platform, and we maintain all current diagnostic and repair tools to ensure our customers have access to the services necessary to maintain their fleets. 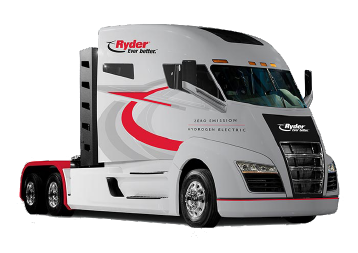 In November 2018, Ryder announced the largest commercial electric vehicle purchase in the United States. On behalf of FedEx Corp., Ryder ordered 1,000 medium-duty electric panel vans from Chanje Energy Inc. The purpose-built electric vehicles will support FedEx U.S. commercial and residential pick-up and delivery services throughout California. Through a combination of Ryder ChoiceLease and SelectCare truck leasing and preventive maintenance agreement, FedEx will have access to Ryder’s network of 800 facilities and world-class technicians across North America, providing critical access to fleet maintenance on a large scale, and supporting FedEx’s emission reduction efforts. This agreement enables broader adoption of commercial EV technology throughout North America. Through our partnership with Workhorse, Ryder provides all electric and range-extended electric vehicles—the E-100 battery-electric, E-GEN® range-extended electric vehicle, the N-Gen® all electric panel van, and W-15 electric pick-up truck. These vehicles can include gasoline generators that activate and replace the battery pack when additional power is needed, such as during bad weather or during busy times of the year. These generators safeguard the vehicle and provide extra range when needed. W.B. Mason, an office products dealer, began serving Brockton, Massachusetts in 1898. Over the last century, the company has grown to become the largest, privately owned office products dealer in the U.S.—with much of that growth coming since partnering with Ryder in 1981. Ryder has since helped W.B. Mason grow from just two trucks to a fleet of 700 trucks traveling more than 13 million miles annually, serving the Eastern and Midwest United States, as well as California. With W.B. Mason’s growth, Ryder has been challenged with expanding their fleet while maintaining industry-high customer satisfaction and ensuring efficient delivery. Through full service leasing, we support the acquisition, management, maintenance, and disposal of W.B. Mason’s fleet. As W.B. Mason continued to grow, the company sought an innovative solution to support its national delivery operations while reducing its environmental impact. Through our relationship with electric vehicle OEMs, Ryder was able to begin leasing a fleet of Workhorse E-GEN® electric, range-extended step vans to W.B. Mason in 2018. Partnering directly with W.B. Mason, Workhorse, and Morgan Olson, the company that builds W.B. 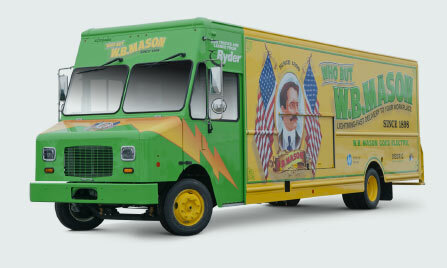 Mason’s vans, Ryder configured a customized truck specification that met the unique delivery requirements of a W.B. Mason vehicle. The E-GEN® step van reduces W.B. Mason’s vehicle emissions by 75 percent and is six times more efficient than a conventional step van. As part of our commitment to stay ahead of the curve on advanced vehicle technology, Ryder takes seriously the opportunity to vet new vehicles and early stage development products that could directly benefit our customers. Ryder’s partnership with Nikola Motor Company is another example of this. As Nikola’s exclusive nationwide distribution and maintenance provider, we can ensure that our customers who may one day use this new truck technology will have the service and maintenance they need at our 800 shop, mobile, and on-site maintenance locations across North America. Ryder is working with utility companies to ensure electrical fleets have access to the electric charging stations needed to support their distribution footprints. Beginning in California, we are seeking to partner with customers and utilities on siting of transmission lines and placement of charging stations. Additionally, we are taking a consultative approach with customers to identify and access grants available for the purchase of electric vehicles and related infrastructure. Ryder maintains the second largest natural gas (NG) fleet in the U.S., with purchases of more than 1,000 vehicles. These vehicles are best utilized for long-haul—highway—driving, and are 15-19 percent more fuel efficient for our rental and commercial full service lease customers to operate than diesel-powered units. Ryder has obtained federal and state grants for NG equipment since 2010, and uses that funding to help offset incremental costs associated with NG vehicle technologies for our customers. To support these vehicles, Ryder has partnered with its fuel suppliers to provide new natural gas refueling stations and works closely with its customers to identify and utilize existing natural gas refueling infrastructure. Today, Ryder’s natural gas fleet has replaced more than 22.55 million gallons of diesel fuel with domestically produced, low-carbon natural gas. Based on estimates using Argonne Labs data points, which is consistent with California’s Carl Moyer program guidelines, the use of these natural gas vehicles has also reduced emissions by more than 50,688 MT CO2e. Ryder has assisted more than 70 customers convert to NG vehicles and developed a “Go to Market” outreach strategy that targets key national accounts and customers. PURCHASED 1000+ natural gas vehicles in the U.S.
Ryder’s unique expertise in advanced vehicle technology, alternative fuel options, and the maintenance know-how to keep these next-gen fleets running, allows us to provide our customers with the tools they need to operate effectively in a changing world. Equipping customers with diverse vehicle choices helps support a variety of needs, such as lowering their carbon footprint, reducing vehicle maintenance costs, or presenting a sustainability message to their customers and stakeholders. Additionally, equipping our customers with diverse fleet solutions helps mitigate business continuity risks associated with utilizing a single fuel, such as rising costs or service disruptions. Ryder’s investments in advanced vehicle technologies benefits us, our customers, and the communities we serve, including through improving fuel economy, enhancing safety, and reducing environmental impacts and long-term operating costs. That is why Ryder continues to invest in developing a diverse fleet utilizing a wide range of advanced technologies and fuel alternatives. At the end of 2018, Ryder had 892 Alternative Fuel Vehicles active in our fleet, including our first 29 electric vehicles.